My father-in-law, Simon J. Kittler is nearly 89 years old. When I look at him today, I’m reminded that all around us, we see old people whose days of impassioned vigor have been replaced by a gentler pace and whose youthful boldness and audacity have been replaced by a wariness of even the next step they take out of concern that they might fall. When we look at them and take stock of their years, it’s difficult to imagine that among them are great heroes who gave so much of themselves and were once willing to sacrifice everything. My father-in-law is one of those people. He grew up in a troubled household in Michigan, but was able to secure a Congressional appointment to the United States Naval Academy in 1949 as a member of the Class of 1953. He was one of four brothers who received congressional appointments to the Naval Academy. 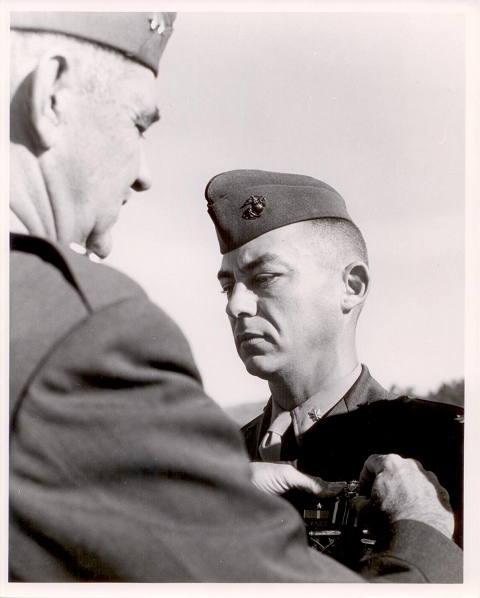 After he was commissioned as a second lieutenant on June 5, 1953, he was able to fulfill a dream inspired by his childhood employer and mentor to lead a platoon of Marines in Korea. Once he returned to the United States in October of 1955, he entered flight training in Pensacola, Florida and upon completion of training in October of 1957, he earned his gold aviator wings. His first assignments as an aviator were with VMA-211 then with VMA-225 as an A-4D Skyhawk pilot, stationed in Edenton and Cherry Point, North Carolina. While he was on a deployment in the Mediterranean on board the USS Essex (CVA-9) during her final carrier deployment, the crew of the Essex and the 17 pilots of VMA-225 collaborated on an unprecedented achievement that possibly remains unduplicated to this day. On January 23, 1960, VMA-225 qualified all 17 of its pilots as Centurions when every pilot in the squadron completed his 100th arrested carrier landing of the deployment on the Essex on that day. Then, in July of 1963, he completed a stint as an instructor in the Air Support Division, training forward air controllers (FACs) at Coronado, California which he later said was a great help to him when he needed to call in fire support missions in Vietnam. Just a couple of weeks after his wife, Peggy, gave birth to a baby boy, his namesake Simon Scott, he deployed with his squadron to the Republic of Vietnam in October of 1964. As thousands of others have done since the early days of our Republic, he left his wife, new son, and two daughters, 6 year old Angela and 2 year old Christina, behind in California. Once in Vietnam, he and his squadron went to work immediately, flying combat missions daily. Within a month of arriving in Vietnam, then-Major Kittler “volunteered to undertake a vital resupply and medical evacuation mission to an isolated Vietnamese outpost located in an area infested with insurgent communist Viet Cong forces. The flying conditions were exceptionally hazardous due to typhoon conditions in the general vicinity, a ceiling of less than three hundred feet and a steady rainfall which severely limited visibility. As leader of a two aircraft flight, (he) fearlessly led the way through intense enemy small arms fire to land at the obscured landing zone. After discharging his supplies and taking aboard several wounded Vietnamese soldiers, (he) again displayed calm courage and superior aeronautical skill as he led the flight through enemy fire and further deteriorating weather conditions to deliver his wounded passengers to a field hospital.” For his heroism that day, he was awarded the Distinguished Flying Cross Medal. While Major Kittler was flying that mission and risking his life to save the lives of others, tragedy was settling onto his own home that same day half a world away where his newborn son, Simon Scott, passed away in his crib. Any sense of relief and satisfaction that he felt over having succeeded in that treacherous mission was quickly overwhelmed by the weight of profound loss and mourning as he boarded a plane to return to the United States to be with his family. With his son buried and his family consoled, he returned to duty with his squadron in Vietnam where he resumed flying combat missions in support of U. S. Marines, the South Vietnamese Army, and U. S. Special Forces. Then on July 12, 1965, he “participated in an emergency medical evacuation and troop withdrawal of an isolated patrol which had been ambushed and surrounded at night. The landing zone, surrounded by Viet Cong, was under a crossfire from three automatic weapons, which made it virtually untenable. In spite of heavy enemy ground fire, unknown landing zone conditions and lack of visibility due to darkness, (he) ... landed and assisted in the evacuation of the patrol,” saving eighteen lives in the process. For his actions that day, he was awarded a second Distinguished Flying Cross Medal for heroism. Then, Major Kittler again transitioned to a new aircraft in 1967, this time to the OV-10 Bronco as a member of VMO-5 before returning to Vietnam in May of 1968 as officer-in-charge (OIC) and pilot in a VMO-2 detachment. Within just a few hours of the squadron’s Broncos arriving in Vietnam from the Philippines, he became the first pilot to fly the OV-10 aircraft in combat. Operating out of Marble Mountain in Vietnam, he flew both the OV-10A and the UH-1E Huey on direct combat support missions for Marine forces. When he was promoted to Lieutenant Colonel in October of 1968, he was transferred to the 1st Marine Aircraft Wing (MAW) G-3 in DaNang to serve as assistant operations and assistant plans officer. While in that assignment, he continued to fly combat missions in the OV-10 and the TA-4 on “Steel Tiger” forward air controller (FAC) missions along the Ho Chi Minh Trail until 1969 when he returned to the United States. Following his promotion to Colonel in July of 1975, he assumed command of the 31st Marine Amphibious Unit (MAU)/Task Group (TG) 79.5. He then served as commanding officer of the Marine Corps Air Reserve Training Detachment (MARTD) in El Toro, California from 1977 to 1980. Finally, Colonel Kittler took command of the Naval ROTC Unit and served as the Professor of Naval Science at the University of Missouri in 1980 before retiring from active duty in September of 1982 with 30 years of service. During his distinguished Marine Corps career, Colonel Kittler saw service in the Korean War as a ground officer then participated in 15 major combat operations as an aviator in Vietnam. 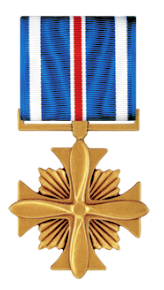 Among his many decorations and awards are the Legion of Merit for valor, two Distinguished Flying Crosses for valor, 22 Air Medals, the Meritorious Service Medal, two Combat Action Ribbons, and numerous unit citations and campaign and service medals. After his retirement from the Marine Corps, Colonel Kittler went to work in program management at McDonnell Douglas in Long Beach, California, working on the T-45, A-4, A-3, and the KDC-10 aircraft. Ultimately, he settled in Pensacola, Florida, returning to his aviation roots where he was able to watch his two grandsons grow, enjoy seeing them play baseball and excel in school, and witness them eventually becoming Marines like their father and grandfathers before them. All along, he inspired them through his love, example, and wisdom. From his childhood and throughout his adult life, during the high points and the low, through critical moments of life and death, and in periods of peace and extraordinary trial, he has been buoyed by his Faith, his family, his country, and his unwavering loyalty and service to them all. Always a humble and composed warrior, he has embraced life with good cheer and selfless personal courage. We don’t know how much longer we will have him with us here, but as he nears the end of his long flight home, we know that we will have him and his legacy forever in our hearts and minds. The author is the former Director of Transportation for the Escambia County (Florida) School District. The Escambia County School District Transportation Department manages one of the largest student transportation operations in the United States, transporting some 24,000 students twice a day every school day. The author is also the co-founder of the Escambia Pathways Coalition, a public-private body organized to identify and correct hazardous walking conditions in Escambia County. One does not need not to look far to discover that the current hazardous walking conditions parameters described in the Florida education code (Section 1006.23) are not realistic or practical by any measure. The statute language itself is a challenge to follow on the first few readings. That makes a routine critical analysis of its implications very difficult. It’s almost as though the statute was written to satisfy a need for a criteria - almost any criteria - but not necessarily establish a sensible standard by which real hazards to students would be identified and remedied. Over the years, there have been several attempts to correct the statute in the state legislature. However, improving the language in a meaningful way has proven difficult for two key reasons. First, some school districts have opposed improvements to the hazardous walking conditions statute because a requirement to transport students around conditions that are more realistically defined than they currently are might also require districts to transport more students, purchase more school buses, and hire more school bus operators, all other factors remaining equal, possibly at a greater cost to districts. Second, the legislature has been very reluctant to approve legislation that isn’t revenue neutral. Past proposals that have improved the definition of “hazardous walking conditions” would have required the approval of additional revenue from the legislature, had they been approved. That continues to be an obstacle to change unless there is a balancing of costs embedded within the proposal. The logic behind my proposal begins with what the statutes describe as a "reasonable walking distance" to and from school for school children. By replacing the reference in statutes to 2 miles as a “reasonable walking distance” with the term “transportation service boundary,” we eliminate the sense that the State of Florida expects students to walk two miles to school. Instead, we want to establish two miles from school as the distance at which state-funded student transportation service begins. It also eliminates the need for the state to make a provision for elementary school students who seemingly would walk two miles to school if not for hazards between home and school that prevent them from doing so safely. With the hazard range decreased from two miles to one mile, it also makes sense to ensure the hazardous walking conditions criteria itself is logical and keeps students safe. Certainly, the true test of the practicality of the language is to consider whether conditions that don't qualify as “hazardous” under the statute are "safe." The current language fails that test dramatically. That the hazardous walking conditions criteria ought to be credible and it should consider the elements of safe infrastructure design. Before touching on the highlights of our proposal, though, let’s look at how we can address the issue of school districts that have concerns regarding the possible need to add school bus routes, purchase additional school buses, and hire more school bus operators under improved hazardous walking conditions criteria. The proposal includes a provision in Section 1006.21 that enables school districts to seek relief from the Department of Education if financial or logistical constraints or limitations prevent them from satisfying the requirements contained in the hazardous walking conditions statute. The hazardous walking conditions criteria and associated state funding should apply to the transportation of students of all ages. A safe and suitable walkway should not be 4 feet wide, it should be 5 feet wide as is required in the construction of sidewalks per the Florida DOT Green Book. The statute should be clear that no part of a drainage ditch or any part of any other stormwater runoff facility or system, including side slopes, is a suitable walkway for students. Railroad crossings, bridges, and overpasses that lack paved walkways are not suitable walkways for students. Students should not be required to cross a roadway between intersections or outside of marked crosswalks in order to acquire a safe walkway parallel to the road. The walking route that is utilized in calculating eligibility for transportation should be used in the application of the hazardous walking conditions criteria. Qualifying traffic volume should reflect the fact that morning traffic near schools generally flows toward school in the morning and away from school in the afternoon. Furthermore, the traffic volume measurement should be focused and specific to the period during which students would walk to or from school because 15 minutes on either side of that period would be irrelevant to the matter and would distort the true sense of the traffic volumes that students encounter. The proposal also allows for traffic to be counted manually if existing traffic engineering records are not specific enough. Qualifying traffic volume should be at a threshold that genuinely reflects a hazard to students. Whether a crossing site is controlled or uncontrolled, roads consisting of more than two lanes of traffic and have a posted speed limit of 35 mph or greater should be considered hazardous for students. Any crossing site where it is likely that student pedestrians would encounter traffic turning from left turn lanes, lanes where a right turn on red is authorized, and free-flow right turn lanes should be considered hazardous for students. The Florida Greenbook acknowledges the importance designing roadways, sidewalks, and crosswalks in a manner that eliminates conflict between motorists and pedestrians, and limiting the use of vehicle traffic flow facilities such as those included in the proposal. Then, we need to make the process of identifying hazardous walkways less cumbersome and less difficult for school districts. For instance, the statute requires a number of steps in the process, some of which are simply not necessary when using an objective criteria. For instance, we should eliminate the requirement to include a law enforcement representative in the process of identifying and certifying a hazardous segment. We also need to address the fact that the statute currently requires that hazardous segments be removed from the state funding list once the expected completion date passes, whether the work is complete or not. School districts should not be left without a state funding contribution when other governmental entities fail to complete work as planned. Since school districts don’t control public works construction schedules, the statute should allow the transportation of students around hazardous conditions to be claimed for a state funding contribution for as long as the hazardous condition exists and the district transports students around it. Additionally, some hazards can’t and won’t be eliminated without a massive roadway overhaul. Finally, my proposal requires districts to review and update declared hazardous segments periodically in accordance with Florida Department of Education procedures. The requirement is intended no only to ensure that districts track the progress of hazard remediation, it also requires that FDOE articulate procedures for them to do so. This would dampen the temptation by agencies to infer procedures informally from the statutes where none exist. So, the big question is whether the impact of the proposal on state revenue is neutral. With the hazardous walking conditions eligibility zone reduced from 2 miles to 1 mile on one side of the ledger and the creation of a credible criteria and the addition of middle and high school students to the eligibility pool on the other side of the ledger, it appears to be neutral. I anticipate that the cost associated with expanding the ages of students covered by Section 1006.23 and the improvements in the definition of the conditions that constitute hazards to student pedestrians is more than balanced by the reduction of the distance from school that hazardous walking conditions would be considered for student transportation. Reducing the hazardous radius by half reduces the number of students affected by more than half. I also anticipate that by improving the definition of the conditions that constitute hazards to student pedestrians, governmental entities that have jurisdiction over roadways and walkway segments will also apply a more practical and realistic standard when identifying and prioritizing work projects. Although the Section 1006.23 criteria was never intended to create a “level of service” standard for governmental entities that are responsible for improving walking infrastructure, we have seen plenty of evidence where those entities have used the criteria to determine whether walking conditions should be improved. Thus, one unintended consequence of the vastly understated hazardous walking conditions criteria is underdeveloped infrastructure planning based on that criteria. I also anticipate that the combination of these proposals would put school districts on firmer ground when designing local student transportation parameters. For instance, with the reorientation of “reasonable walking distance” parameters, school districts can point first to the distance from school where transportation service begins rather than whether hazardous conditions that exist 1-2 miles from school would warrant transportation service. In providing a realistic and practical definition of “hazardous walking conditions,” school districts could actually rely on statute for guidance in that regard rather than create local criteria that can be fluid and contentious. Finally, the option for school district superintendents and school boards to seek relief from the requirement to transport students around hazardous conditions reduces the likelihood that they will oppose an improvement to the statute on the basis of the availability of resources in order to comply. That notwithstanding, I anticipate that the reduction of the distance from school relative to the hazardous walking conditions parameters from 2 miles to 1 mile will actually reduce school districts’ compulsory transportation footprint, not increase it. Currently, more than half of Florida’s school districts claim no State funding for transporting students around hazardous walking conditions. It has been difficult to find a solution that leaves the citizens of Florida with an improvement to the hazardous walking conditions criteria that is also generally revenue-neutral and doesn’t place an onerous burden on school districts that are unable to adapt to the improvements. I believe this proposal has found a way to get it done. To view and download the proposed statute, click HERE. To view and download a video presentation that contains more details, illustrations, and background information, click HERE. I just finished watching the video of the February 21st Escambia County Commission's discussion of Commissioner Robert Bender's suggestion and subsequent successful motion to convene a committee to explore courses of action for naming the new Pensacola Bay Bridge. In spite of the Commission’s 3-2 vote to convene the committee, the issue has already been drawn out enough that several commissioners already know where they stand. On one side, there are those who believe that the naming of the current bridge in memory of Senator Philip D. Beall, Sr. should pass on to the bridge that is being built in its place. On the other side, there are those who believe that the new bridge should be named to honor the memory of Pensacola native General Chappie James. After several citizens spoke on the matter, some of them veterans who supported naming the bridge in honor of General James, Commissioner Bergosh was the first to speak from the dais. He went to great lengths to tell the audience that he is not anti-military. In doing so, he talked about his family members who served or are serving in the military, but then he strayed off and essentially undermined his own assertion by insulting the veterans he said he supported. He should have just said that he's a huge supporter of the military and veterans and let it go at that. Then, Commissioner Bergosh went on to discuss the record of Senator Beall, Sr. He said that he found it "disingenuous" and "disgusting" that those who had unveiled disturbing aspects of Senator Beall, Sr.'s record were dragging the Beall family's name through the mud "out of convenience or faux outrage of today's values juxtaposed against the historical realities of 200, 300, 400 years ago." Then, he referred specifically to “the realities of history in the '30’s in the South.” So, what are the "realities of the '30's in the South" that Commissioner Bergosh was referring to? They refer in part to the fact that in 1935, Senator Beall authored a bill that ultimately became one of the now-infamous Jim Crow Laws that excluded African Americans from voting in Florida Democratic primaries. That's not dragging his name through the mud; that's a fact of history and when he did it, the 15th Amendment of United States Constitution, ratified in 1870, forbade the denial of African Americans the right to vote. The 15th Amendment declares, "the right of citizens of the United States to vote shall not be denied or abridged by the United States or by any state on account of race, color, or previous condition of servitude." For context, state legislatures and courts throughout the South worked persistently for decades to circumvent the 15th Amendment. The entrenchment of Southern society in the supremacy of whites and the fixation that Democrats had on preventing Republicans from diluting the political influence of Southern whites by permitting African Americans to vote was clear and pervasive. When Senator Beall submitted his bill to exclude African Americans from voting in Democratic primaries, the Pensacola News Journal published an editorial that endorsed that effort: "Pensacola is a city of white folks. Negroes have their place. A great majority of them are good citizens. But, when we are selecting men who are to govern us, we do not want any balance of power to be in the hands of the colored people." During the Commission meeting, Commissioner Bergosh seemed to pardon segregationists in the 1930s as merely being products of their time when he said that the 15th Amendment didn’t specifically preclude poll taxes and literacy tests and other workarounds whose consequences would disenfranchise African American voters. However, this isn't about poll taxes and literacy tests. The fact is that Senator Beall's efforts to disenfranchise African Americans weren't nearly as subtle or nuanced as the poll taxes and literacy tests were. His actions were quite overt and direct. So, the question is whether we should hold Senator Beall's political actions in the 1930s against him in 2019. In my view, he was part of the problem in the South where as a leader, he permitted the racist attitudes that prevailed in the South before the Civil War to persist and undermine efforts to provide full rights of citizenship to African Americans after the Civil War. It should be no real surprise that within the "rank-and-file" citizenry at the time, the Jim Crow Laws like the one that Senator Beall wrote would be well-received. As we remember that Senator Beall didn't merely vote for a Jim Crow Law, he wrote one, we also must acknowledge that leaders of courage change flawed and immoral paradigms; they don't perpetuate them. What Senator Beall did might have been good politics in Pensacola in 1935, but it wasn't courageous leadership. We can't excuse that kind of leadership today simply on the basis that it was the going rate at the time. With respect to memorializing figures in history, Commissioner May said, "Symbols do mean things. There's no place to ever to think that monuments and things that happened don't affect our daily life today." There is no prism of “today’s values” in the scrutiny of Senator Beall's record. History has demonstrated that it was wrong for southern state legislatures to circumvent the Constitution in order to continue the institutional discrimination against African Americans. Period. Senator Beall, Sr. passed away in 1943, 8 years after he took office as a senator. Commissioner Bergosh informed the public that Philip Beall, Jr. who succeeded his father in office after his death distinguished himself during World War II and had been held in a German POW camp after being shot down. What Commissioner Bergosh didn't tell the audience was that Senator Beall, Jr., having served with distinction during the war which ended in 1945 and succeeded his father in the senate in 1947, was a member of the infamous “Pork Chop Gang” that worked vigorously to preserve segregation in the 1950s and 1960s in the midst of the Civil Rights Movement. I can't help but contrast that record with General James' record. 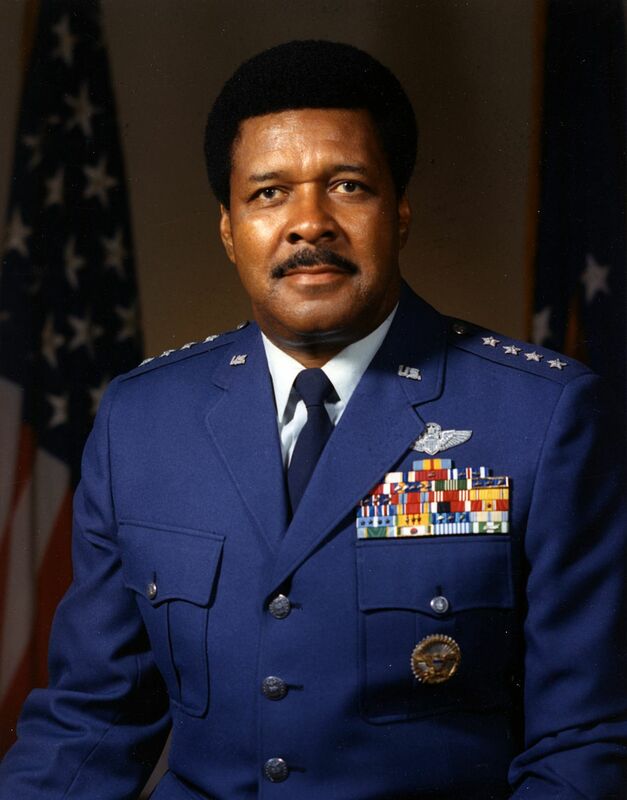 He was the first African American four-star general in the armed forces, having flown combat missions and been decorated several times for valor in the Korean and Vietnam Wars as evidenced by his three Distinguished Flying Crosses and twenty-two Air Medals. (So yes, he too was a combat veteran.) As for his family, he, like Senator Beall had a son who followed in his footsteps. One of General James' sons joined the Air Force and became a three-star general. I believe the decision-making on the naming of the new bridge should be deliberate and deliberative, but it shouldn’t be unnecessarily drawn out. I don’t see that engaging a committee to arrive at a conclusion that it appears most of the commissioners already have is necessary. As Commissioner Underhill said at the meeting, "I don't need a committee to tell me what other courses of action there might be. This (naming the new bridge in honor of General James) is the right course of action." And there's a flaw in the premise that this issue must be discussed with all of the “communities,” identified at the Commission meeting as African-Americans and other minorities, and military members, etc. As Commissioner May said at the meeting, "Chappie James wouldn't want a bridge named after him because he's an African American; he'd want a bridge named after him because he's a Great American." So, to position the matter properly, the decision whether to name the bridge in honor of General James is not about simply honoring an African American or a military person, it’s about honoring a Great American who served his country with extraordinary distinction. It's worth saying here that Commissioners May and Underhill clearly and eloquently stated positions in support of naming the new bridge in honor of General James. Both staked out compelling positions that our symbols and memorials are meaningful in our daily lives and that "merit" should be the standard by this these things are determined. To that end, Commissioner Underhill said, "I often hear in civilian life that rank has its privileges, but that's not how we do it in the meritocracy of the military. Rank doesn't have its privileges; we call it a burden. And it is a burden so immense that there really are no words that I can use to explain it." It's my belief that the manner in which these two men, Senator Philip Beall, Sr. and General Chappie James handled the burden of leadership in their times is important to our community and that honor and merit should be the new "reality" by which they are recognized and revered. I also believe that the public monuments and memorials that we erect today should represent the best among us: our best people, our most-esteemed principles, and our fundamental core values. That is how these structures can best and most positively affect the daily lives of people today. Retired combat-decorated Marine Corps officer and helicopter pilot. Former business owner and manager. Retired teacher and school district administrator. Robert A. Doss. Picture Window theme. Theme images by mammuth. Powered by Blogger.